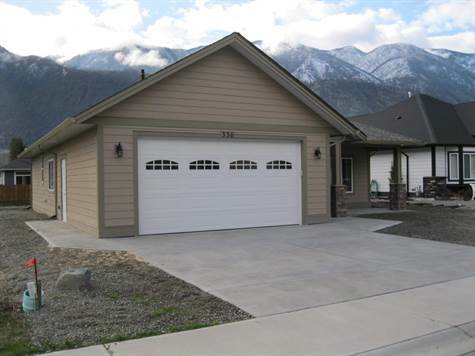 "Stylish Rancher in Subdivision of Fine Homes"
Bedrooms: 3 "Master 15'10 x 11' "
Bathrooms: 2 "Ensuite with Generous Walk-in Shower"
Garage: Double, Attached "462 sf drywalled"
Brand New Home in quality Keremeos Subdivision. Be the 1st owner of this 1384 sf rancher in Victoria Estates Subdivision on Forner Cres. Great Room Style with 3 Bedrooms, 2 full Bathrooms, full-size Laundry Room. Features include 9’ ceilings, Rounded corners; floor-to-ceiling gas fireplace and Massive Island in Kitchen plus Corner Pantry with Etched Glass; lots of cupboards and pull-out drawers. Master has walk-in closet and ensuite with spacious step-in shower and seat. 4 piece Main bath has soaker tub & solar tube. Plank-style vinyl flooring throughout. Central Air, On-demand high efficiency Water Heater, Roughed-in for vacuum system. Gas furnace has 2 stage variable speed fan motor and floor joists are engineered trusses. Durable Cement board siding. Extra-wide 462 sf Double Attached Garage. Covered back patio has natural gas barbeque outlet. Level front entry for easy access. All homes on Freehold lots located on quiet, one-way circular road within walking distance to shops & restaurants. 2-5-10 Warranty. Price is plus-GST.